is pleased to offer for resale, condominiums in our luxury development, Ocean Bay Club. 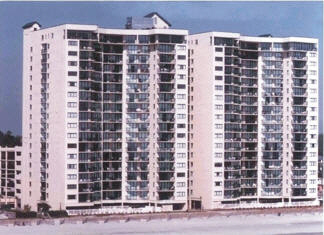 Located in the popular Ocean Drive section of North Myrtle Beach, Ocean Bay Club features a total of 166 spacious three and four bedroom villas, including six penthouses, all with spectacular views of the Atlantic Ocean. The condominium interiors are decorated with ceramic tile in the foyer, kitchen and master bath, and the open kitchen plan includes all the necessary appointments for “at home comfort”: breakfast bar, refrigerator, dishwasher, microwave, disposal and electric range. The master bath features a garden tub with whirlpool, separate shower, and double lavatories with molded cultured marble top. The outside amenities include a heated ocean-side and indoor pool, kiddie pool, whirlpool spa and lazy river. You will also find a fully equipped exercise and fitness room on the third floor. Access to the exciting and fun-filled area of Main Street is walking distance away.